Went with the family to see Space Shuttle Endeavour and a Pixar-themed exhibit on computer animation at the California Science Center. Apply different textures and bump maps to an object. Rig a character for movement. Change the lighting of a scene (real or virtual). Define a shape in a 3D grid and watching the computer rotate it (way too much time on this one). Create your own stop-motion animation by moving an actual desk lamp. The only way we got him out was to point out that the museum was closing, and we only had 10 minutes left to get to the touch pools he’d said he wanted to visit. As it turned out, the pools shut down about two minutes before we got there, but staff was willing to let him look at the starfish. And we did catch the last desert flash flood simulation of the day. Admittedly, a big aluminum hut isn’t as suitable a viewing area for Endeavour as open space in broad daylight, surrounded by an enthusiastic crowd. Though that might have been the fact that it was my first time getting up close. On the other hand, this time I could see both sides. Heck, I could walk under it! 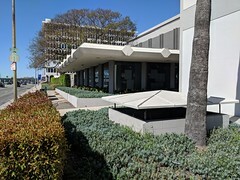 There is a new building in the works, where they’ll be displaying it with one of the external tanks in launch position. 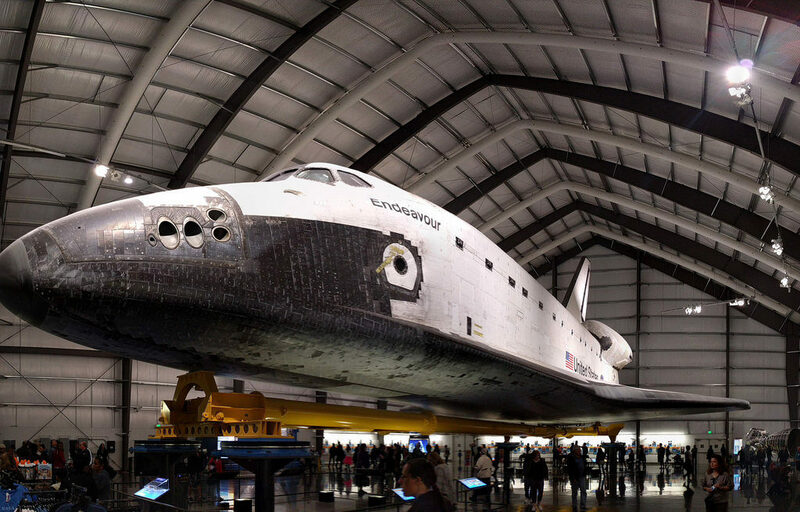 I’m sure it will lead to plenty of cartoons and movies where someone goes to the museum, breaks into the shuttle and blasts off. I couldn’t make the building line up with my memories of visits when I was younger, back when it was the Museum of Science and Industry. The only thing I could match up at all were the wall facing the Exposition Park rose garden, and some of the buildings by the parking lot (a sunken structure now, but I remember it being flat). It turns out there’s a good reason nothing fit my memory: They tore down the whole building in the late 1990s, preserving only that one wall! This entry was posted in Sci-Fi/Fantasy, Space and tagged Endeavour, memories, museum, Pixar, science, shuttle on March 4, 2017 by Kelson. Last month I had the good fortune to watch Endeavour’s landing at LAX from the office building where I work. 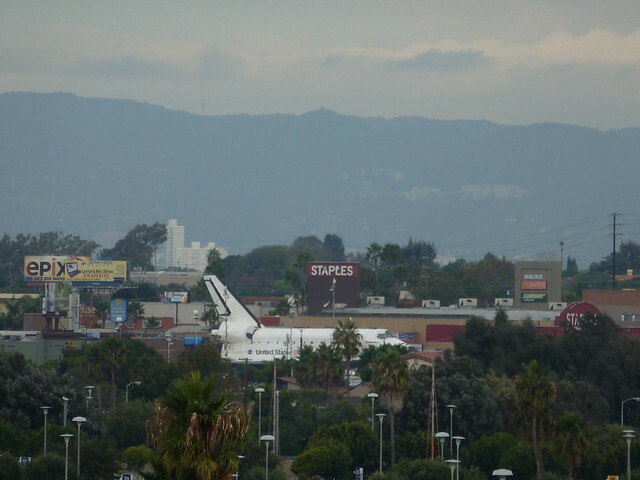 Today I had the opportunity to see the space shuttle up close while it stopped at a parking lot in Westchester. When I got to work this morning, the shuttle had already left the airport hangar where it had spent the last month, and was sitting in a parking lot a mile or so away. I didn’t have time to go look at it, but I did have time to climb up to the top of the parking structure and look for it. This entry was posted in Highlights, Photos, Space and tagged Endeavour, Long, Los Angeles, shuttle, spottheshuttle on October 13, 2012 by Kelson. 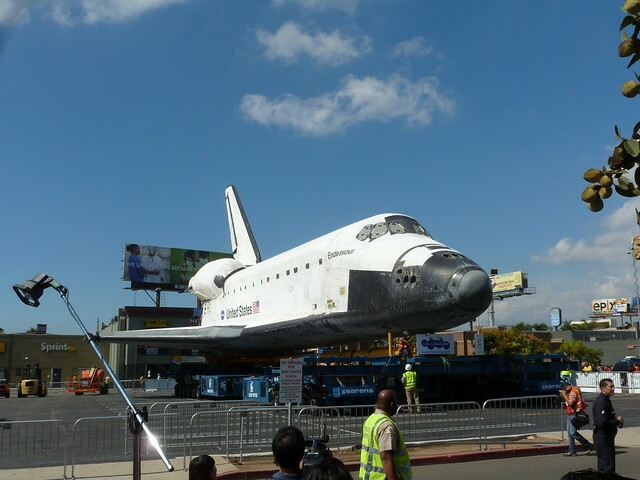 Update: If you’re looking for photos from Endeavour’s trip through the LA streets in October, I’ve got those too. And that’s it. The final flight of the space shuttle has come to an end. 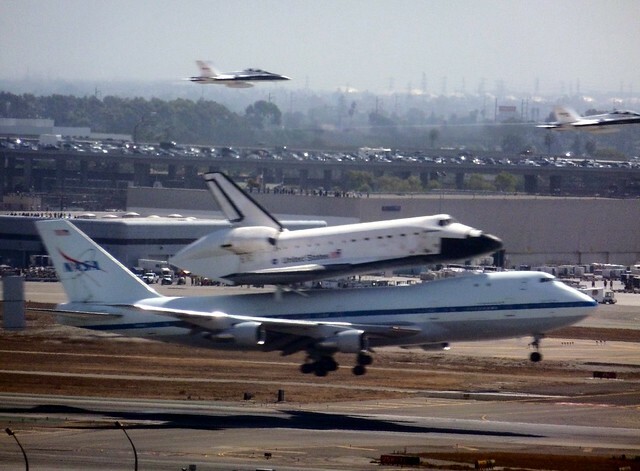 The last shuttle landing I saw was Discovery in 1988. My family went out to Edwards Air Force Base to watch it land. 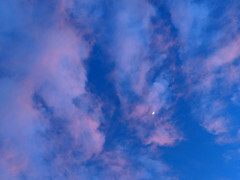 I posted a photo essay on the event last summer when the shuttle flights stopped. 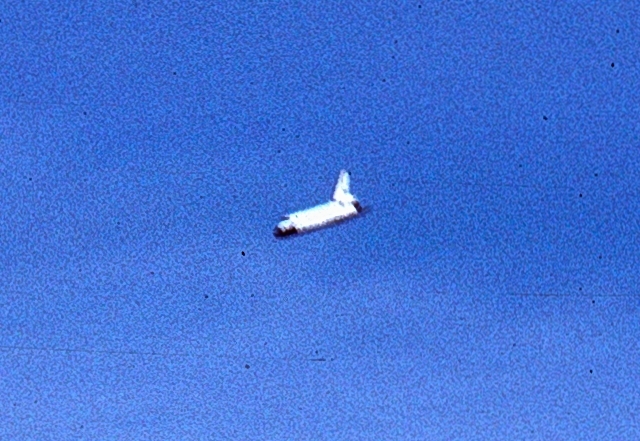 The 1988 landing was a normal Shuttle landing. It landed under its own power, from orbit, and it was all business. We civilians camped out all night on a dry lake bed, kept outside a fence so far away from the landing strip we could barely see the shuttle without binoculars. This entry was posted in Highlights, Photos, Space and tagged Airport, Endeavour, LAX, Long, Los Angeles, shuttle, spottheshuttle on September 21, 2012 by Kelson. When I was twelve, I went with my mom, brother and a family friend to see the Space Shuttle land at Edwards Air Force Base. It was the first mission after the Challenger disaster, and the orbiter was Discovery. This entry was posted in Highlights, Photos, Space and tagged 1980s, 1988, discovery, landing, memories, NASA, shuttle on July 19, 2011 by Kelson. This entry was posted in Computers/Internet, Strange World and tagged 911, Android, Cliq, mobile, phone, shuttle, Tweets on September 11, 2009 by Kelson.